Recently, Nathan and I have been talking about finding a new house to rent. While our current place has always had its pros and cons, lately the cons seem to be taking over. Pros: we have a huge backyard with more than enough room for chickens, dogs, and a garden. We're close to everything - downtown, the university, the beach, the YMCA. We are right next to a really lovely and expensive neighborhood, which makes running and walking the dogs an absolute pleasure. You will notice that all these pros relate to the exterior of the house. This is not a coincidence. And true - those are all cosmetic things, which should be easy enough to overlook. But this winter especially, we've come to realize the Very Worst Thing about this house. Heating it. As far as space heaters go, it is small but powerful. We put it in the bedroom at night and I sleep like a baby. When I wake up and go into the kitchen to make coffee, I am slapped in the face with a burst of arctic air, but that's okay, because I scurry back to the bedroom as fast as I can. I have taken to spending my mornings working, not at my desk, but under my blankets, the space heater pulled close, the dogs at my feet, my laptop and coffee close by. It's actually kind of nice, though I'm beginning to miss the living room. Thus, we'd like to move this summer, when our lease is up. Which wouldn't be a problem, except for the fact that we need to find a place that is dog-friendly... and chicken-friendly... and bee-friendly... and garden-friendly. Oh, also really, really cheap. Wish us luck. 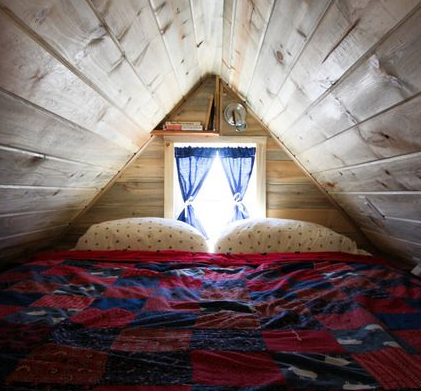 To avoid thinking about out residential prospects, I've become obsessed with tiny houses in the middle of nowhere, cozy cabins with just enough space, hideaways where only the essential and necessary are welcome. While I'm fairly certain none of these places exist in Wilmington, it's nice to daydream about the possibilities in our far-off future. Here are some of the best ones I've found through Pinterest. This one would make a garden tricky, but at least it would be helpful in case of a zombie apocalypse. 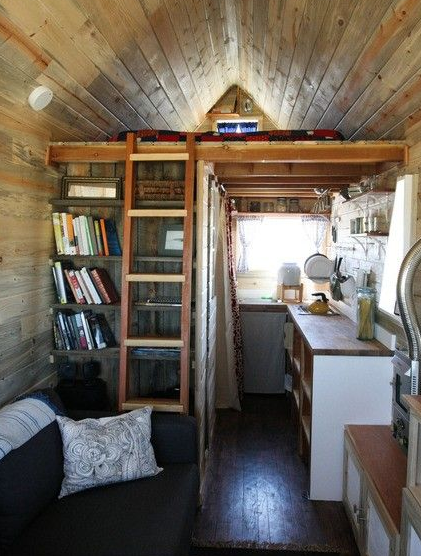 I love a tiny space + a loft bed. 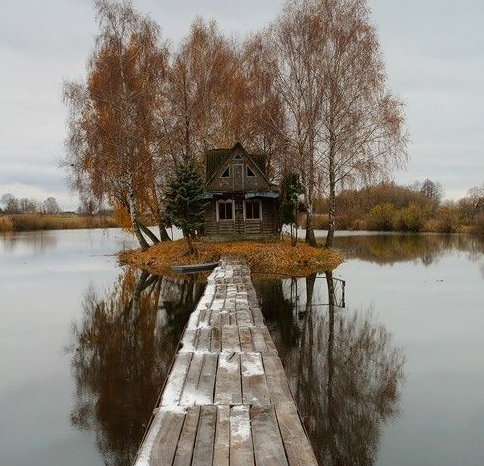 This one seems particularly cozy. Plus one little space heater would probably be sufficient for the whole house. Drawers under the bed, high ceilings, exposed wood, big windows. Be still my heart. 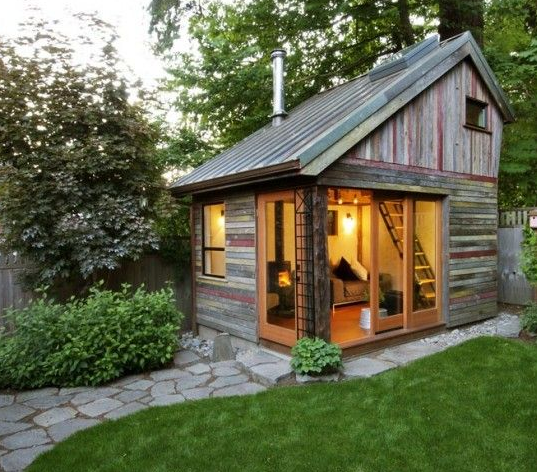 I love this one - it's compact, simple, and appears to have a loft bedroom as well. And I could probably fit two dogs in there, if only Calvin would lose a little weight. 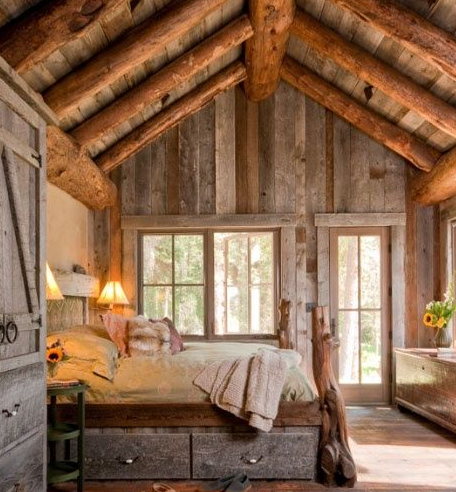 Don't you just want to crawl up there and cuddle the night away? Since it will be a few months until we can find a new place, and years and years until I can get my tiny cabin in the woods, we'll just have to make do with what we've got. Which isn't really that bad - especially since the high today is supposed to be in the 60s and spring is on its way. In the meantime, I'll be wearing three pairs of socks and a bathrobe, and daydreaming about our future home.